The BEST Puppy Chow (Muddy Buddies) recipe and it’s SO easy to make! You will love this decadent chocolate peanut butter cereal treat! 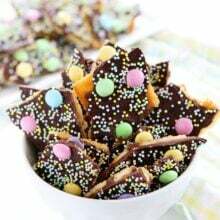 It is the perfect party recipe and always a hit during the holidays. Puppy chow is one of my all-time favorite treats, and I am not talking about dog food. I promise I haven’t lost it:) I am talking about the decadent chocolate peanut butter cereal treat that is covered in powdered sugar. It’s kind of like dessert Chex Mix. 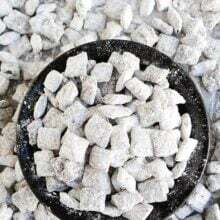 I grew up making and eating puppy chow, it was a staple at our house especially during the holiday months. 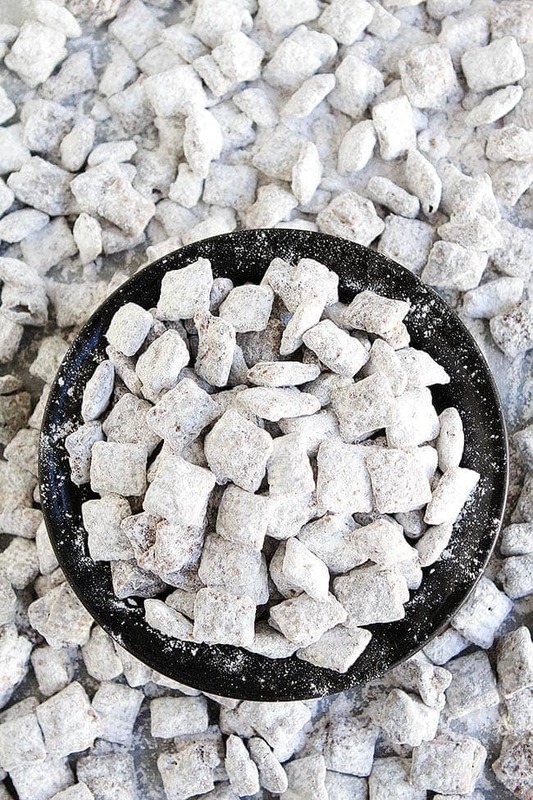 If you have made puppy chow, you know it is one of the best treats of all-time. And if you haven’t made it, you are in for a real treat because you are going to LOVE this easy recipe! 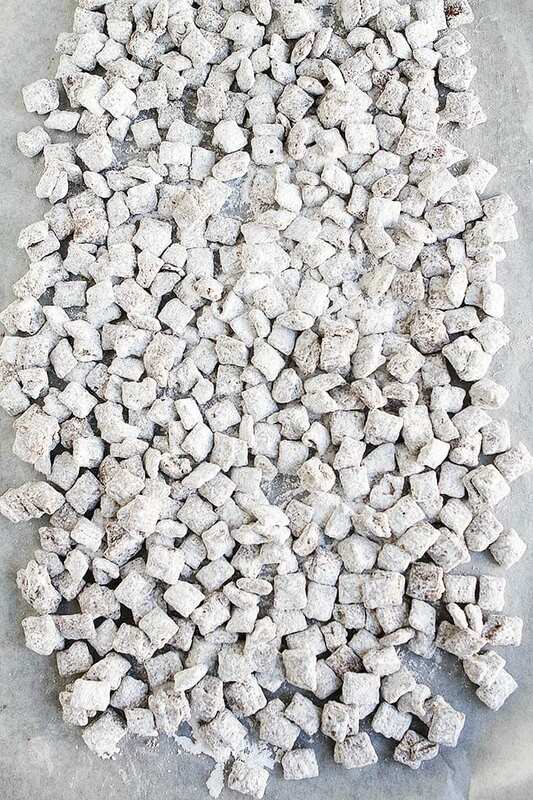 Puppy Chow or Muddy Buddies? 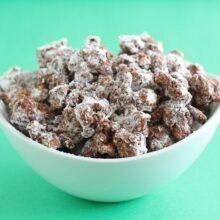 Rice Chex cereal-I use Rice Chex cereal to make puppy chow.You can use Corn Chex cereal, but I prefer the rice cereal flavor. You can also use Crispix cereal, but the shape of your puppy chow will be a little different. Chocolate Chips-I use semi-sweet chocolate chips, but you can use milk chocolate chips. Peanut Butter-I use creamy peanut butter and not natural peanut butter. Think JIF or Skippy for this recipe! Butter-I usually use unsalted butter, but if you want a little salt kick, salted butter works too! Vanilla Extract-add a little vanilla extract for a nice vanilla kick. You can never go wrong with vanilla! 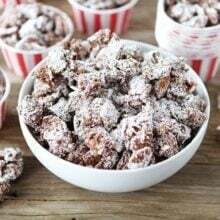 Powdered Sugar (Confectioners’ Sugar)-the powdered sugar gives the puppy chow the perfect sweet finishing touch and gives the puppy chow it’s signature look. Easy, right? I make sure I always have these ingredients on hand so I can make puppy chow anytime and all of the time! 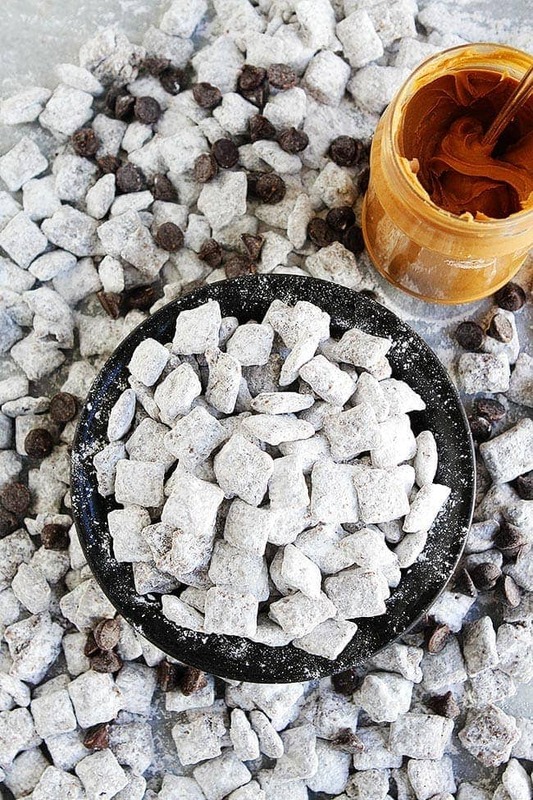 Puppy chow is a no-bake treat, which makes it even better. You can whip up a big batch of puppy chow in no time! Use a medium, microwave safe bowl to melt the chocolate chips, butter, and peanut butter together. Start with 1 minute on high, stir, and heat again for about 30 seconds. Stir again. If the mixture isn’t melted, you can heat for 10 more seconds and stir again. Don’t over heat. You want to heat just until the mixture is smooth. Stir in the vanilla extract. You will need six cups of Rice Chex Cereal. Yes, only SIX cups. 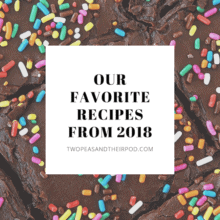 A lot of recipes call for nine cups, but my friend Rachel taught me that six is the magic number to maximize the chocolate peanut butter flavor. Again, I like to use Rice Chex, but corn or Crispix will work too. Place the cereal in a large bowl and pour the chocolate peanut butter mixture over the cereal. Stir GENTLY with a spatula. Make sure you don’t break up the cereal, you want it to stay in whole pieces. When the cereal is evenly coated, place it in a large Ziploc bag and add the powdered sugar. You will need 1 1/2 to 2 cups, depending how coated you like it. Make sure you seal the bag and shake! Kids love helping with this part:) Shake until all of the cereal is white and well coated. Open up the bag and pour the puppy chow onto a big piece of parchment paper or wax paper. Spread the puppy chow in a single layer so it can cool and not stick together. Let sit until the chocolate is hard. To speed up the process, you can put it on a tray and put it in the refrigerator. You can also put puppy chow in decorative Christmas tins or bags to give to friends, family, and neighbors for the holidays. Everyone loves this easy homemade holiday gift! If you need an easy treat to take to a party, puppy chow is always a hit! Put out a big bowl and I guarantee it will be gone by the end of the night. It is always a good conversation starter too. People will wonder why it’s called puppy chow and their might be a debate about if the correct name is puppy chow or muddy buddies! It is the ultimate chocolate peanut butter treat! And it’s perfect for holiday parties because it looks like snow. Warning, your fingers will become coated with powdered sugar, but that really isn’t a bad thing:) ENJOY! Chex or Crispix cereal coated in a mixture of peanut butter, chocolate, butter, vanilla, and dusted with powdered sugar. This easy treat is always a hit at parties! Place the chocolate chips, peanut butter, and butter in a medium microwave safe bowl. Microwave on high for 1 minute. Remove the bowl from the microwave and stir. Put the bowl back into the microwave and heat for an additional 30 seconds or until mixture is smooth when stirred. Add the vanilla extract and stir again. Pour the cereal in a large mixing bowl. Add the chocolate peanut butter mixture and gently stir until cereal is evenly coated. Pour the coated cereal into a large Ziploc bag. Add the powdered sugar. Seal the bag and shake until the cereal is well coated. Spread on parchment paper or waxed paper. Let sit until cool and chocolate is set. Store the puppy chow in an airtight container for up to 2 weeks. If it is warm in your kitchen, store the puppy chow in the refrigerator. I love that you call it Puppy Chow! That is what we called it when I was growing up. So good! Our family always made puppy chow for the holidays! It’s the best! Puppy chow is SO good! Need to make it ASAP! My little guy doesn’t like peanut butter (I know!). Can you recommend any substitutions? Thanks for you help! These are amazing frozen! When my kids were small we would make a giant batch, then freeze it in snack size bags. So good! An excellent recipe, I will cook for my children on the weekend. I think they will like it. I make it every year, and certain people have come to expect it . I also put raisins and peanuts in with the cereal. Being from the South, we always called it White Trash.